If you clicked on this post, it’s probably because you want to learn how to take photos for your blog, with or without a personal photographer. One of my greatest struggles with my blog is trying to take pictures for it. I started this blog because I loved to write, and while I love photography, I had no idea the huge role it also plays in blogging! I hardly ever have someone willing to take pictures of me, and I always feel bad making my friends take lots of pictures of me to get that “perfect” shot. 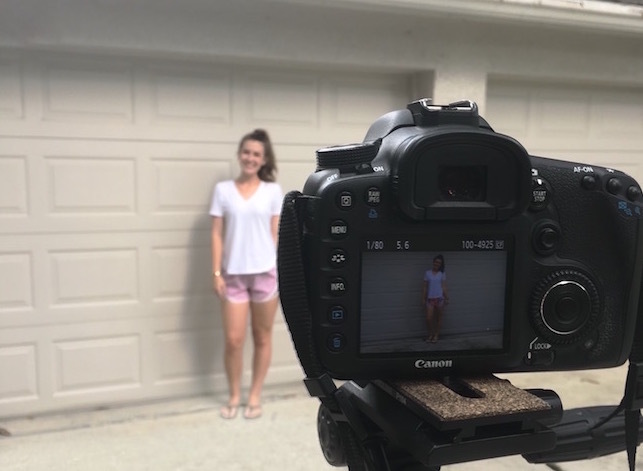 We can’t all be lucky enough to have an “Instagram-boyfriend” (or someone to constantly pictures for us) to do photoshoots for us, but I have learned a few easy tricks to take your own photos for your blog! This one is obvious, but it can be awkward sometimes to ask your friends to take a solo picture of you. Just ask! I’ve found that when we’re out-and-about (or dressed up for an event), my friends are always willing to snap a picture of me, and they usually want a photo in return! Taking pictures for each other is a win-win, even if you don’t get a full-on photoshoot. There’s no shame in a tripod! Given, they can be pricey and are a pain to haul around and set up, they get the job done. My dad has a nice DSLR camera and two different tripods, so I use them to take some outfit photos while I’m home, when I don’t have someone to take pictures for me. An example of an at-home tripod shot from my Instagram and this post! Update (1/5/18): I have my own DSLR camera now, and it works with an app that lets your smartphone be the remote for your camera, which makes self-shooting even easier! Another picture-taking tool with a bad rap! I wouldn’t recommend carrying them around all vacation like some tourists do, but I would recommend them as a cheaper alternative to a tripod. I ordered a selfie stick on Amazon for a few bucks, and it’s been useful for a couple of my pictures. With a little practice, you can use it to take pictures that aren’t super obviously selfies when you’re in a pinch. My selfie stick connects to my phone via Bluetooth, so I can also use it as a remote for my phone. Use the iPhone’s timer feature. Whether you knew it or not, iPhones have a built-in timer on the camera which you can use (like the timer-tripod method) to take pictures of yourself. Finding a good spot to set up your phone can be a challenge, but the feature is useful for taking hands-free pictures. I’ve also used this feature to take some of my Instagram pictures sans-photographer. A huge key to taking better photos, or making the ones you do take count, is knowing your lighting, poses, and angles. If you are having someone random take your picture on the spot, they most likely won’t snap 100 pictures for you like the blogger-in-you really wants, so you’ve got to be ready to make the one picture a good one! Practice your poses in the mirror beforehand, and learn a few go-to poses that you always like on yourself. I wish I knew the perfect tricks for scoring those amazing Insta-worthy shots. It can be difficult to keep your creative energy when there are so many awesome bloggers putting out new content and photos nonstop. But I also know you don’t need to spend a bunch of money on props and clothes to take good pictures for your own feed! With a little creativity, you can easily use things you already own to style new photos. White blankets make good backgrounds that can easily be brightened (I like to use the “Facetune 2” app for this) for flat lay photos. House décor items, like coffee mugs or fake flowers, can be great additions to pictures, too! If you spend a few minutes taking inventory of cute items you already own, I know you can find a few things that would make great additions to your next Instagram shot. For my most recent product pictures for my Etsy store, I used a blanket and some decorative items I already had to dress up the pictures. I even used a sweater for the pink “blanket” seen below. Again, I’m no pro, but I have learned my way around photo editing apps. I’m not talking full-airbrushing or anything, but learning how to properly edit pictures makes a huge difference. Like knowing your angles or using natural lighting, photo editing can drastically improve the quality of your photos. This simple trick, along with slightly enhancing the brightness and saturation of my pictures, helps me create a more cohesive feed! I could write a whole post about the editing apps I use, but my favorites are Facetune (free and paid versions), Aviary, VSCO, and Photo Editor-. There’s no end-all-be-all formula for taking the perfect pictures, especially all by yourself. But, with a little work and practice, these simple tricks can help you take better photos for your blog! If you practice taking your own photos, you’ll be even more “ready for your close-up” when you are lucky enough to have a willing photographer. Every picture can’t be your best, but you can’t improve unless you try! So, what are you waiting for?! Get out there and take some pictures! Honestly, I take the majority of my photos at home/myself. It can be done! Start simple, and find what works for you. If you use any of these tricks, I’d love to see your shots! Feel free to leave me a comment below, or send me an email: kristenshaneblog@gmail.com if you have any questions about my photos or anything I mentioned, I’d love to chat! Such great tips! Thank you for creating this post! Definitely know the struggle of asking friends or being too shy in public but its pushing me out my comfort zone! Same here! So maybe it’s actually a good thing then, right?! Oh I so wish my DSLR would use my phone as the remote! That would definitely be a huge help! Such a great article, Kristen! I always have a hard time finding people to take my pics too! I need to be better about taking them myself. Thanks for the tips! You’re welcome, Jodi! Good luck with it! Love this! I recently discovered my camera has a tripod feature! Super great tips!! I’m still trying to figure out how best to dp this myself as well. It’s a constant learning experience, but so fun! Love this!! It is so hard being a blogger and also getting photos of yourself all the time. A few months ago I jumped on the tripod bandwagon and it has made such a difference!